My dear sons, in Chapter LVIII of the Holy Rule, our father Saint Benedict, inserts the act of solemn profession into the Offertory of the Holy Sacrifice of the Mass. This is an astonishing thing! The action of the Mass is, for a few moments, suspended or, rather, it is opened up in order that you might be intimately associated with the offering, the setting apart, of the host that now lies upon the corporal — a thing utterly humble, fragile, and poor — and of the chalice of wine mixed with a drop of water. Raise your eyes to the glorious Face of Christ. Thrust your hands upwards into His hands, and in your weakness you will know the power that goes out from His wounds, giving resurrection to those in the tombs. Solemn monastic profession, effectively, makes you dead men: dead to the point of being incapable of possessing, receiving, and giving; dead to the point of being incapable of transacting marriage. Saint Benedict says: “Whatever property he hath let him first bestow upon the poor . . . keeping nothing of it all for himself, as knowing that from that day forward he will have no power even over his own body” (Chapter LVIII). Hear, then, what the Apostle says: “We are made a spectacle to the world, and to angels, and to men. We are fools for Christ’s sake” (1 Corinthians 4:9–10). 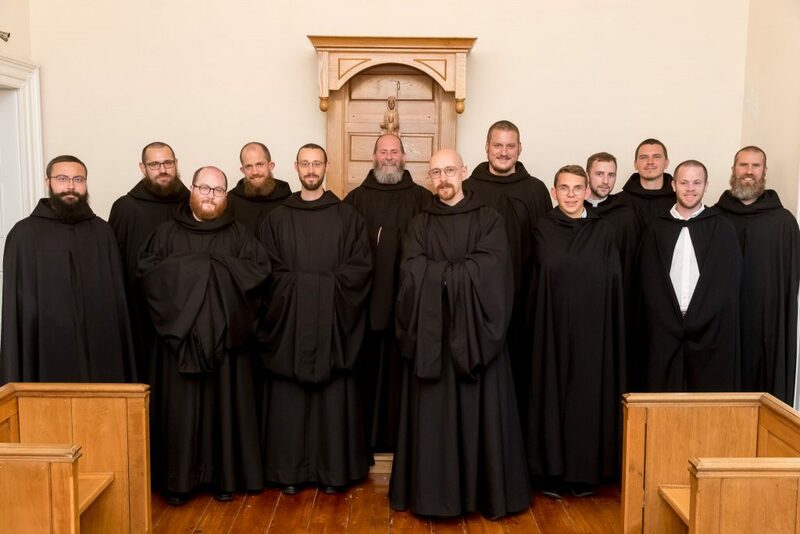 Yes, dear sons, there is a madness in monastic profession; the madness of an irrepressible hope in “things no eye has seen, no ear has heard, no human heart conceived, the welcome God has prepared for those who love him” (1 Corinthians 2:9). You will disappear under the funeral pall, an image of the water that flowed over your heads on the day of your Baptism, making you dead in Christ and alive in Christ. 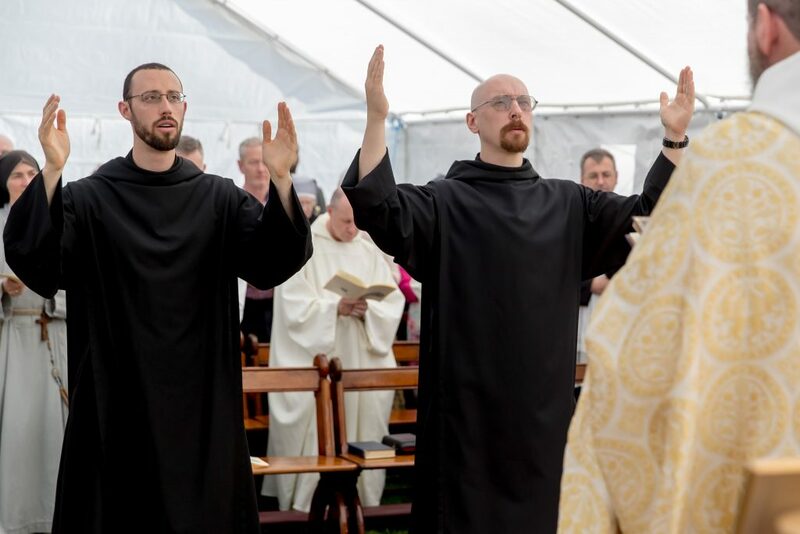 The Fathers tell us that monastic profession is a second Baptism, a going down into the tomb, a coming out of the womb. You have come, then, not only to the hour of a new participation in the death of Christ, but also to the hour of a new participation in His resurrection. While you lie prostrate and altogether hidden, like the grain of wheat buried and dead in the ground (cf. John 12:24), the Church will raise her voice on your behalf in a solemn priestly prayer, begging God to do in you all that you, dear Dom Finnian and dear Dom Elijah, cannot do in yourselves, or by yourselves, or for yourselves. 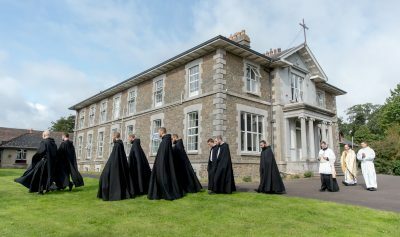 In pronouncing your vows, you will be the doers of the action, speaking in your own voice before God and in the presence of the Church, but during the prayer ad faciendum monachum (for the making of a monk), you will have only to lie still, to keep silent: as still and as silent as the Host on the corporal. The great consecratory Preface is akin to the magnificent prayers of the Roman Pontifical by which the Church hallows and sets apart persons, places, and things for God alone. Its special grace comes, not from anything you do or say, but from what is said and done over you in the power of Christ’s priestly mediation. At the end of the great prayer of consecration, the cry of the Apostle will summon you into the light of Christ: “Awake, thou that sleepest, and arise from the dead, and Christ shall give thee light” (Ephesians 5:14). Only then will you be clothed in the distinctive garment of the solemnly professed and consecrated monk: the cuculla with its immense sleeves symbolizes the contemplative life. It will identify you, dear sons, as men set apart for the One Thing Necessary. The traditional Gospel for this festival of the Assumption is Saint Luke’s account of the hospitality given Jesus in the house of Bethany. It was, by the inspiration of the Holy Spirit, and following a luminous theological instinct, that the Church, for centuries, proclaimed and meditated this Gospel in reference, not to Mary of Bethany, but to the all–pure Mother of God, Mary most holy, assumed into heaven, and seated in quiet repose at the feet of her risen and ascended Son in glory. Holy tradition has long applied this same word of the Gospel to the vocation of the enclosed monk. In a world and, indeed, even in a Church, where too many souls are burdened with cares and anxious about many things, remain, dear sons, on behalf of all and for all, at the Lord’s feet, listening to His Word. Prefer nothing to the Opus Dei prolonged in adoration of the Most Holy Sacrament of the Altar. Allow yourselves to be repaired in the radiance of the Host and, in so doing, you will be silent repairers of a Church that, in every generation and in every place, needs to be rebuilt, consolidated, and made beautiful for the Bridegroom Christ. 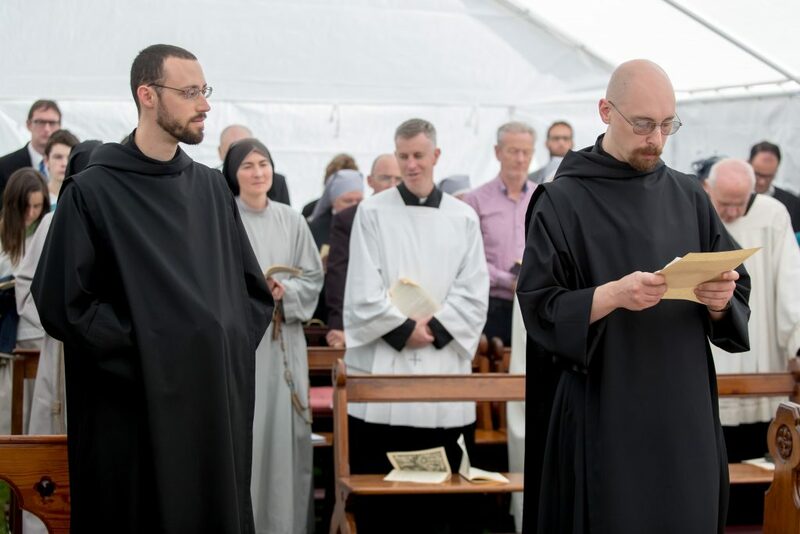 “Our whole monastic life” says Abbot Delatte, “should resemble this profession Mass”. In receiving your solemn profession and in consecrating you monks today, I entrust you, dear Dom Finnian and dear Dom Elijah, to the the Blessed Virgin Mary gloriously assumed into heaven. I pray her to keep inviolate, and fragrant, and fresh the grace that is yours today. It is a grace not for you alone, but for each one here, and for the whole Body of Christ, the Church.